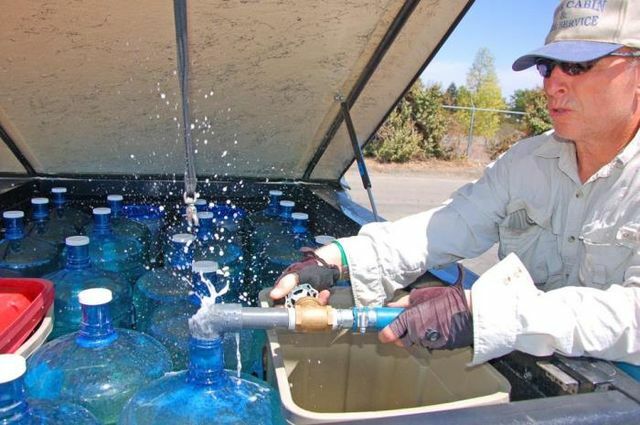 Dozens of California water agencies in 2015 opened recycled water “fill stations,” allowing customers to collect treated wastewater in jugs and tanks for free. It helped drought-weary residents maintain parched landscaping, and it also eased recycled water’s ill-deserved “yuck factor”. California’s current drought may well be remembered as the crisis that introduced people to recycled water. All over the state, water agencies in 2015 began offering customers free recycled water at designated “fill stations.” Bring a container – even a big tank in a pickup bed – and take all you want at no charge. It’s a whole new kind of water product that bloomed because of the drought. And in some communities, it has been embraced by residents eager to keep treasured landscaping alive. Looking back decades from now, we may remember 2015 as the year recycled water became cool. Gallagher’s agency, in July 2014, was apparently the first in California to open a public filling station for recycled water. But many others soon followed. The state is not keeping a tally of how many exist now, but it’s safe to say dozens are in operation. Nick Hansen started a blog last year to help track the status of recycled water fill stations – where they are and when they’re open. And, it would seem, he’s the right man for the job: Hansen is a senior plant operator at the Central Contra Costa Sanitary District, a regional wastewater treatment plant in the Bay Area. He helped launched a fill station at his plant, then started the blog to help others find recycled water. Let’s be straight about what this water is: it is treated sewage, the same stuff people flush down their toilets. When dispensed at the fill stations, it has been treated to so-called “tertiary” standards, which means it has been filtered and disinfected. It is not suitable for drinking, but is perfect for landscape irrigation. Most of this water is discharged from sewage treatment plants into rivers and bays by the billions of gallons. The fill stations repurpose only a small percentage of this flow. But it is proving to be an excellent grassroots way of introducing the public to recycled water, long considered the major hurdle to adopting large-scale recycled water systems. The truth is, all the water we drink now has already been recycled. Before your water utility diverts water from a stream for treatment and then plumbs it to your house, much of that water got into the stream as discharge water from a wastewater treatment outfall upstream. Tettemer’s district opened a fill station in August 2015, and 200 people signed up to use it. By early December, it had dispensed more than 52,000 gallons. The idea of the fill station sprang to life when many communities restricted landscape irrigation to conserve water. At the same time, many utilities also imposed strict conservation requirements on their customers. And some adopted tiered water rates, which increases the price of water as the customer consumes more. So a number of water agencies responded by offering the fill stations. It solves a problem for the water agency, as well, by creating another means of dispersing treated wastewater, and easing demand on potable water supplies. It also offered a chance to educate customers about recycled water without taking on a large project, like the massive wastewater recycling sytem completed by Orange County Water District in 2008. That multimillion-dollar project, which was expanded in 2014, is the largest of its kind in the nation. It was completed only after a lengthy educational program to help customers get past the “yuck factor” and understand that treated sewage can be safely recycled through the drinking-water system. Most agencies with recycled water fill stations offer it only to their own customers, who, when they pick up water, usually get a brief education about where it came from and how to use it safely around their homes. “Response has been slow but steadily building,” says Jeff Reinhardt, a spokesman for the Las Virgenes Municipal Water District. The district has had 161 customer visits at its fill station. He attributes the slow response to the fact that the district opened its fill station toward the end of summer, when water demand had already begun to taper off. But the district also requires customers to take a brief class before they are eligible to use the water, which may act as an obstacle. Most agencies merely require customers to sign an educational form. The city of Roseville was the first in the Sacramento region to offer a free recycled water fill station. Todd Jordan, a senior engineer for the city, said it was a natural extension of its larger recycled water program. Over 20 years, the city has built a so-called “purple pipe” system to distribute treated wastewater in parts of the city for irrigation purposes. This year, Roseville also began requiring construction companies to use recycled water for dust control, which they collect in tanker trucks at designated hydrants around the city. And they pay for this water: 44 cents per 100 cubic feet, or about half what potable water costs. In 2015, Roseville delivered more than 1 billion gallons of recycled wastewater for the first time ever. “I think that, in itself, shows it’s a valuable resource to our community,” Jordan said. Matt Weiser is managing editor of Water Deeply. He can be reached via email at matt@newsdeeply.org, or via Twitter at @matt_weiser.